This garland might be a little bit brighter than my usual makes – but with Easter almost upon us I couldn’t resist adding a bit of whimsy to my kitchen shelves! The carrots are made using the chilli pattern (which is free on Love Crochet) I used to make this garland for Love Crochet magazine way back in 2014. I’ve given instructions for the daisy below and also added notes on making the carrot tops. To make the garland I simply made a 20ch, slip stitched into the first chain to make a hanging loop and then made a long chain, joining on alternate carrots and daisies every 15 chains by working a dc into one of the petal loops or the back of the carrots. Once I had added all the flowers and carrots, I made 35ch, then slip stitched into the 20th chain from the hook to make another hanging loop. 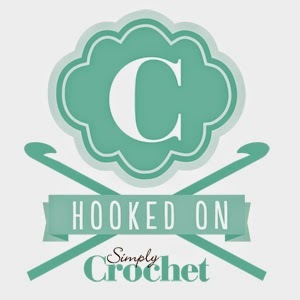 The colours I used are from the Yarn and Colours Must Have Cotton range (White, Sorbus and Peridot), most of the major yarn companies have suitable cottons in their ranges. Try Paintbox yarns cotton DK (Paper White, Blood Orange and Grass Green) Or Rico Cotton (White, Orange and Fir Green), but I encourage you to dive into your stash for this one (I did)! I hope you enjoy this project, it certainly makes visitors to my kitchen smile. 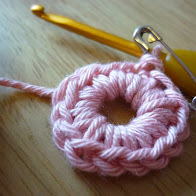 With orange yarn and 3mm hook make 6ch, join with a sl st to make a ring. Fasten off orange and join white to any dc. Round 3: 1dc in same place as join, 9ch, sl st in same place as dc, (dc in next dc, 9ch, sl st in same place as dc) 11 times. Fasten off yarn, weave in ends. Press flowers on the reverse once made. 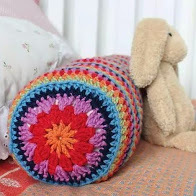 To make the carrots, follow the chilli pattern in this free download. Use Orange yarn to make your carrots. Join green yarn to any dc on last round of carrot, 5ch, 1sl st in 2nd chain from hk, 1sl st in each of next 3ch, 1sl st in same place as dc, (1dc in next dc, 5ch, 1sl st in 2nd chain from hk, 1sl st in each of next 3ch, 1sl st in same place as dc) in each dc around. Fasten off yarn and weave in ends. To make the garland you’ll need an even number of daisies and an odd number of carrots. Join a daisy first, then alternate between carrots and daisies, finishing with a daisy. Note: this post contains affiliate link, this means I earn a small commission on purchases made by readers clicking on these links).